TopResume's executive writers give the Obamas' resumes a makeover as they transition out of the White House and back into the job market. As the presidential power officially shifts hands, Barack and Michelle Obama are back on the market. And given that they likely haven’t dusted off their resumes in nearly a decade, it’s time for an update! 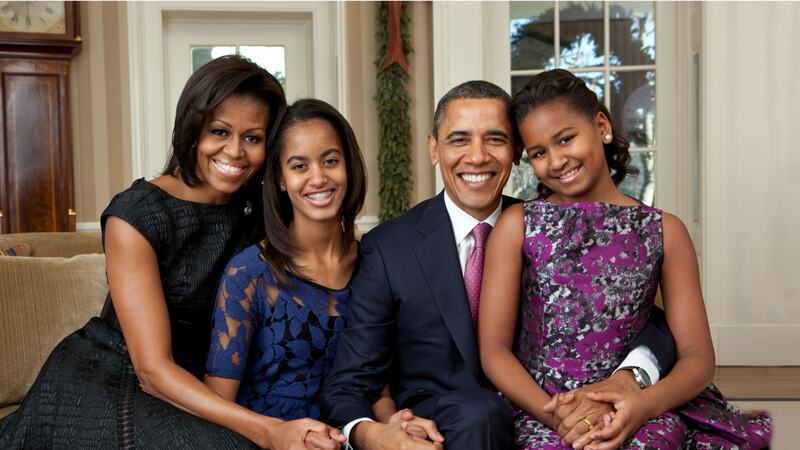 My challenge as their unofficial resume writer (call me, Barack and Michelle!) was to survey the market and dig into their most impressive achievements as President and First Lady. Given that they are likely to enter new industries in their “encore” careers, it was also vital to uncover their most transferable skills. I tell clients every day that if they have multiple job targets – like the Obamas – then they should have multiple versions of their resume. This helps your resume play nicely with employers’ applicant tracking systems and shows recruiters and hiring managers that you took the time to actually read their job description! The Obamas built such powerful brands for themselves during their time in office that choosing a direction for their next jobs will be a challenge. Mr. Obama is a sports fanatic and could surely find an opportunity to join the ownership team of a professional franchise. He could also go the book-tour route and write an amazing memoir (CALL ME, BARACK!). Mrs. Obama has evolved into a fashion icon and influential role model for women, as well as an advocate for poverty awareness, physical activity, and healthy eating. It would be easy for her to take her talents to a multibillion-dollar nonprofit or join forces with an international human rights initiative. For the sake of this project, I drafted the following resumes the specific targets of CEO and politician for Mr. Obama and Mrs. Obama, respectively, while also offering them the latitude to tweak a few things here and there to be ready for other roles. Enjoy and remember, it’s never too late to pursue your encore career! 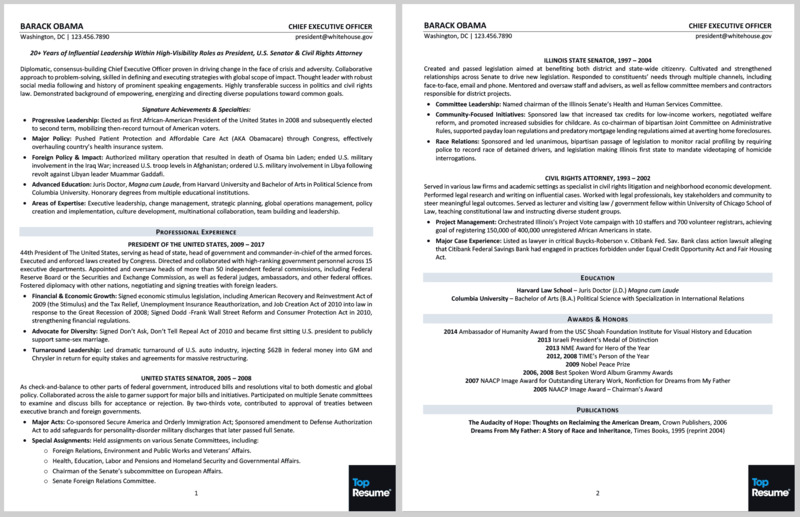 An executive resume is best expanded to two pages, though I would recommend that Mr. Obama has a concise one-pager as a leave-behind for conferences and other engagements. All the key pieces of a strong executive resume are here: (1) an engaging opening summary with strategic keywords integrated throughout; (2) a signature achievements section, coupled with more industry buzzwords to help the resume pass through HR’s shields (i.e. the applicant tracking systems); (3) a balanced professional experience section with a distinct separation between his tasks and achievements; and (4) education and engagements sections to close the document with an achievement-focused flair. 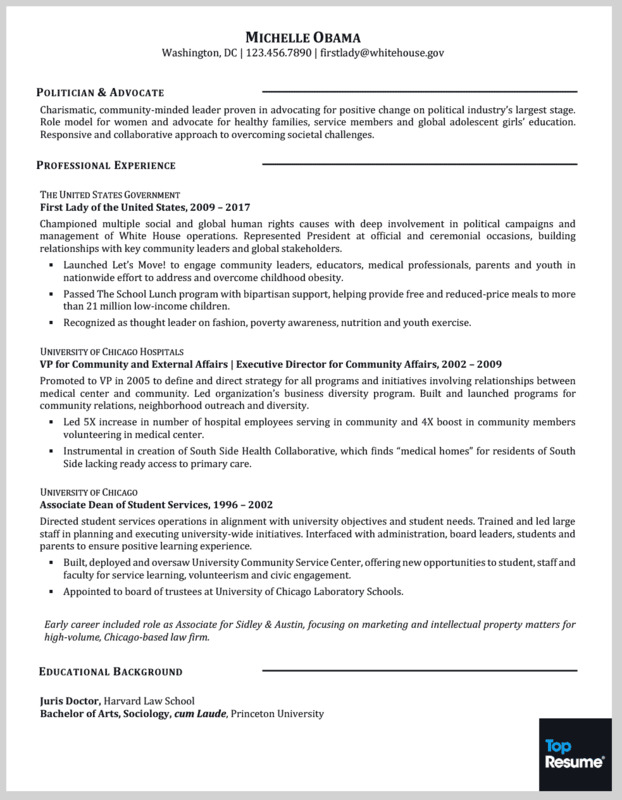 A solid one-page resume generally works best for politicians, as a reader can learn more about the candidate’s in-depth policies and stances from their website. Although Mrs. Obama has publicly nixed the idea of her one day running for POTUS, there are real opportunities for her to drive legislation in Congress or for a multinational nonprofit. Politicians generally do not gain employment opportunities based upon their actual resume, as most of these roles are earned through networking and relationship-building. 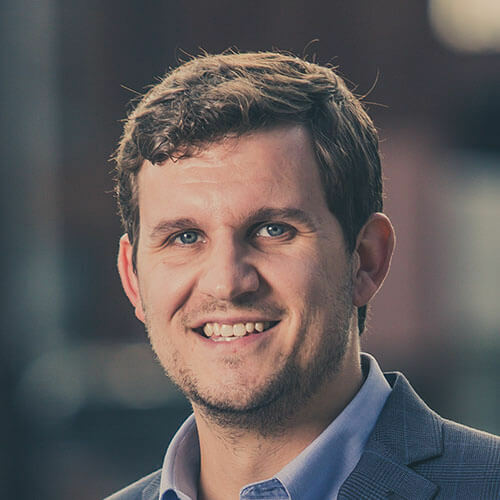 Particularly at the local level, candidates must take their message to the people and connect with them in a down-to-earth manner. Mrs. Obama has already done this legwork. Her resume serves as a documented record of her achievements that she can share with media and other key partners. Our TopResume executive resume writers are ready to position you for continued career success. Reach out today to get started with a free critique of your executive documentation. From there, we can work together on next steps, whether you need some fine-tuning or an across-the-board overhaul.